A 4-year-old right whale entangled in heavy fishing rope 40 miles east of Jacksonville, Florida, in Feb. 2014. A group of New England senators is calling on the U.S. government to speed up an analysis of Canada’s efforts to protect the endangered North American right whale, and to consider trade action if Canada’s rules do not prove as strong as in the U.S. The right whale’s numbers have dropped to only 450, following an unprecedented spate of dead whales found in Canada’s Gulf of St. Lawrence last year. The senators say U.S. fishermen have made big sacrifices to reduce impacts on the whales. Now they’re calling on the National Oceanic and Atmospheric Administration to investigate whether fishermen in Canada are being held to similar standards. If not, they say, then NOAA should consider barring the import of Canadian seafood from the relevant fisheries. “It’s really a double-edged sword,” says Patrice McCarron, executive director of the Maine Lobstermen’s Association. McCarron says Maine’s lobster harvesters do not relish the prospect of a trade dispute with their neighbors to the north. “That is a very big hammer to use, but given the fact that we have media report after media report threatening that this whale species could go extinct, and our fishery potentially could be shut down because of that, I think it does rise to the level that we have to have all options on the table,” she says. McCarron acknowledges that the two countries’ fisheries are interdependent: because the Canadian lobster harvest is strongest in winter and the U.S. harvest is strongest in summer, together they keep the world supplied with American lobster year-round — and they keep cross-border market infrastructures humming. That’s why the Maine Lobster Dealers’ Association is opposing the senators’ approach. “There is a very complicated and intricate supply chain that happens beyond the boat and beyond the dock,” says Annie Tselikis, executive director of the dealers association. Tselikis says the industry depends on consistent supply and on smooth avenues for trade. “In the absence of both of those things, it’s very difficult for lobster businesses to maintain their markets and customer base. So the ripple-effect of an issue like this would be massive for lobster companies in Maine,” she says. 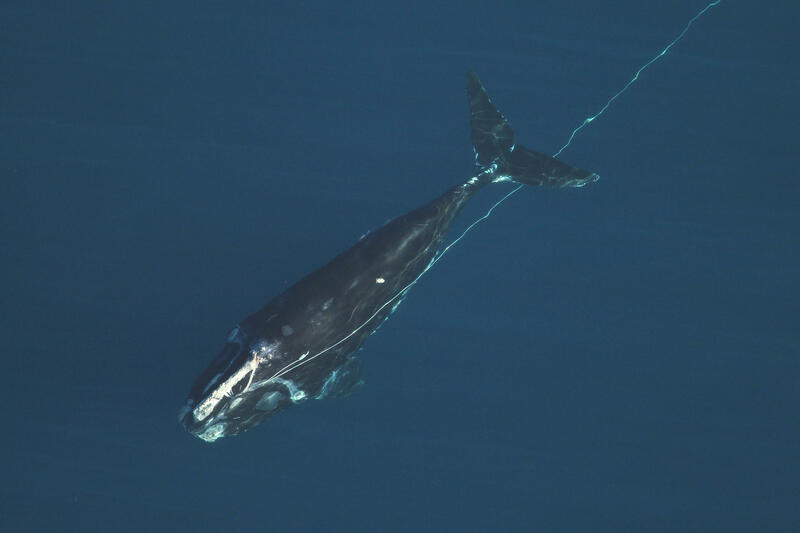 Most right whale deaths are attributed to entanglements with fishing ropes and buoys or ship strikes. Since 12 whales turned up dead in the Gulf of St. Lawrence last year, Canadian fishery regulators have taken action, including new gear requirements for New Brunswick’s growing snow crab fishery, and moving its season around in an effort to get rope out of the water before the whales might show up. In the letter, its author, U.S. Sen. Ed Markey of Massachusetts, applauds Canada’s actions, but he also says he’s concerned it’s not enough. In Canada, the prospect of a shutout from American markets has rattled government officials. “The closure of access to that market would be the biggest single devastating thing that could happen to the Canadian seafood industry,” says Canadian federal fisheries minister Dominic LeBlanc, who recently told lobster fishermen that the stakes require the most protective conservation action possible. LeBlanc noted that U.S. regulators are responding dynamically to the whales’ movements — actions Canada will need to follow up on. “Because there were upwards of 90 right whales that were spotted off the coast of Massachusetts, the Americans decided to delay the opening of a lobster season. Those right whales — make no mistake about it — are heading north,” he says. The letter was co-signed by senators from New Hampshire, Connecticut, New York and New Jersey. Maine’s senators were notably absent from the signature list. In a joint statement to Maine Public Radio, U.S. Sens. Angus King and Susan Collins of Maine say say NOAA should use diplomacy to ensure the rigor of Canada's standards, but if that fails, then a formal investigation of Canada's fishery regulations should be accelerated. They stopped short, however, of supporting potential trade action. The Canadian Broadcasting Corporation contributed reporting from Moncton, New Brunswick.